Eloy Alcala listens to evidence in a suppression hearing in advance of his capital murder trial at the Hidalgo County Courthouse on Monday, Sept. 24, 2018, in Edinburg. Alcala was convicted of capital murder for the 2010 deaths of two Las Milpas men and was granted a new trial on appeal. EDINBURG — The third week of the Eloy Alcala capital murder trial wrapped up Friday with jurors beginning to get a look at the evidence Pharr police collected, allegedly linking him to the 2010 deaths of two Las Milpas men. Alcala, 51, was convicted of two counts of capital murder in 2012 for the deaths of Victor De la Cruz, 35, and David Garcia, 21, who were fatally shot in the early morning hours of Oct. 8, 2010. Police discovered the men lying in pools of blood outside De la Cruz’s van at the intersection of Sabino Avenue and Santa Monica Street, the ignition still running. Forensic pathologist Dr. Norma Jean Farley, who conducted the autopsies, told jurors Friday it appeared the men had been shot from close range. The prosecution alleges that Alcala and his son, Eloy Jiovanni Alcala, shot the men after Jeovanni was involved in an altercation with Garcia shortly before the murders. The younger Alcala was convicted of capital murder in 2011 and is serving a life sentence. A new jury is hearing his father’s case for a second time after the 13th Court of Appeals reversed Alcala’s conviction and ordered a new trial, finding that the trial court — the 332nd District Court — erred by allowing jurors to watch Pharr police’s interrogation video of Alcala. In its order, the appellate court found that although Alcala “issued an unambiguous affirmative response when investigator (Robert) Vasquez asked him if he wanted to consult with an attorney” when advised of his right to remain silent, Vasquez and investigator Michael Perez proceeded with the interrogation, repeatedly accusing Alcala of lying. When Perez took the witness stand in 2012, he “testified extensively regarding inconsistencies in Alcala’s statements. He explained that these inconsistencies led him to be suspicious that Alcala was responsible for the murders,” the order reads. 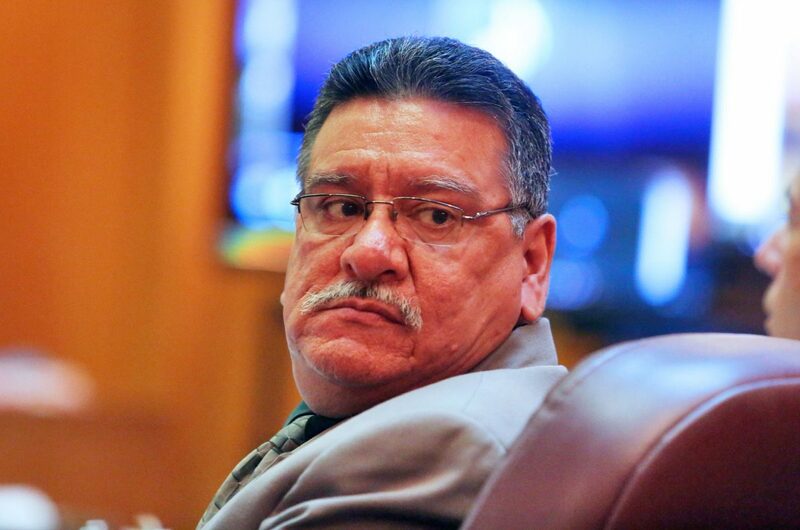 Perez, who is now employed as an investigator with the Hidalgo County District Attorney’s Office, briefly took the stand Thursday and Friday, and will return Monday to detail his role as lead investigator. He will not be allowed to mention the interrogation during his testimony, otherwise risk a mistrial. As the trial enters its fourth week, jurors will hear from Texas Department of Public Safety Crime Lab analysts who conducted DNA, fingerprint, gunshot residue and ballistics testing on evidence recovered at the scene of the shooting and Alcala’s house. Pharr police ID technician supervisor Janie Arrellano and Lt. William Ryan showed jurors this past week the two weapons and clothing police recovered at Alcala’s residence and ammunition found in his truck, with Ryan testifying that a thorough search of the house “was not done.” Rather, Alcala handed over a .40 caliber rifle and a 9 mm pistol to police. Through her questioning of Ryan, Assistant District Attorney Monica Baron Auger emphasized that Alcala “led officers to the weapons,” and police never searched the home’s gun safe nor other buildings on his property. Arellano also showed jurors a pink receipt found at the scene of the shooting that matched receipts discovered in Alcala’s truck, all of which were from Matt’s Building Materials. Defense attorney Jaime Alemán, however, highlighted the fact that police made no effort to contact the store to verify who had made the purchases. Alcala has maintained both his innocence and his son’s in the eight years since De La Cruz and Garcia were killed, and the defense’s theory of the case is that the true shooter or shooters got away after police “narrowed” their search upon speaking with Garcia’s family, who blamed Jiovanni for the murders. In his opening statement, Alemán mentioned two men who might know something about the crime — De La Cruz’s younger brothers, Luis and Roberto. Neither brother was called to testify at Alcala’s first trial, but assistant district attorneys Auger and Carisa Rivera Casarez brought them to the stand during the third week. At times the brothers’ testimony contradicted each other, their timelines of the night not always matching. However, both said they had been drinking and using drugs with the victims in the hours leading up to the shooting. At some point, Garcia left and allegedly got in a fight with someone, with Luis testifying he wasn’t sure with whom, and Roberto testifying that Garcia told him that Jiovanni “jumped” him. After Garcia returned to the festivities covered in blood, Garcia and Victor left. Whereas Luis said he heard gunshots about 20 minutes after they left, Roberto estimated the shots broke out 45 minutes later. Police testified Luis arrived at the scene around 3 a.m. and was arrested for public intoxication. Roberto was arrested at approximately 2:15 a.m. a few blocks away from the scene on an outstanding warrant, with Roberto testifying he had driven to Garcia’s house after hearing gunfire and had tried to head to the intersection, located just a few blocks away, on foot. Luis also caught the defense off-guard when he admitted to giving police a fake name of who he thought was responsible for the crime. Earlier in the trial, police dashcam videos, which were not shown during the first trial, revealed Luis telling officers he thought someone who went by the nickname “Corn Nut” knew what had happened. On Tuesday, Luis testified that he made the name up to throw off police because he wanted to settle his brothers’ deaths himself. Asked by the prosecution if they had anything to do with their brother’s death, Luis and Roberto emphatically responded that they hadn’t.